If you’re an avid follower of UK classical music festivals, you are sure to have heard of our famed Young Musicians Platform Competition, which is open to those under the age of 18 at a minimum of grade 7 and living or attending school in the south-west of the UK. Well, the time has come once again to enter if you’d like to win a prize of £250 and the chance to play alongside seriously impressive professional musicians at next year’s Two Moors Festival. The deadline for entries is January 31st, with the first round of the competition taking place on March 6th, 7th and 8th. For the first audition, you must prepare two contrasting pieces that last no longer than ten minutes in total. You can download the entry form on our website, as well as find out more about the competition itself. If you’d like to hear from some of this year’s winning musicians, we featured interviews with each of them earlier in 2014. 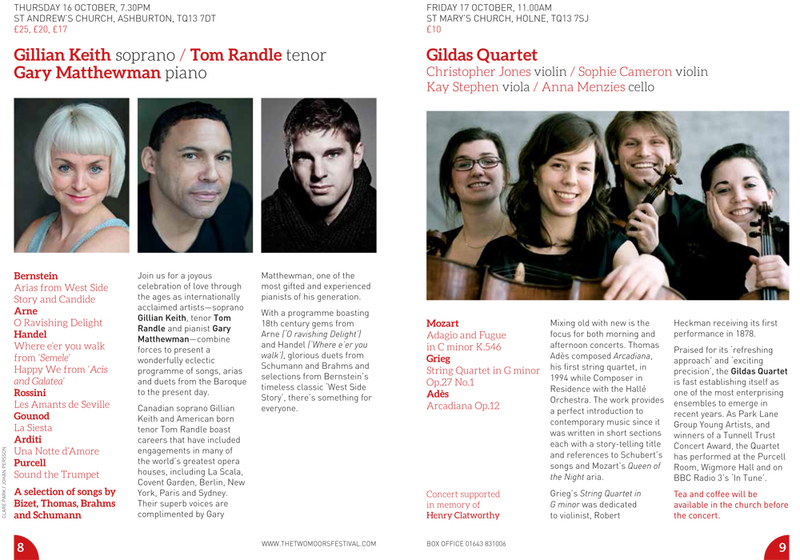 Read our chat with cellist Willard Carter here, our interview with cellist Rebecca McNaught here, our talk with violinist Hannah Brooks-Hughes here and our chat with cornet player Andy Wingham here. People outside the classical music industry may not be aware, but professional instrumentalists often face the same sort of career-ending injuries that sportsmen and women do, from hearing loss and anxiety-related conditions to neurological conditions like focal dystonia, which can lead to fingers and hands failing to respond. Luckily, there are steps you can take as a professional musician to help reduce the chances of sustaining an injury and yoga and pilates could prove particularly useful. You can improve your body strength, breathing and posture awareness through this sort of exercise – important since the instrument you’ve chosen to play may not be all that ergonomic and when you’re playing them for hours on end day in, day out, you will start to notice all sorts of aches and pains. Fancy giving it a go? Help Musicians UK is now putting on a class at MU HQ, Clapham Road, London on August 19th as part of Wellbeing Week 2014 to show musicians how the ancient art of yoga can be beneficial. We’d love to hear from you if you do go, so get in touch to let us know if it helped at all. 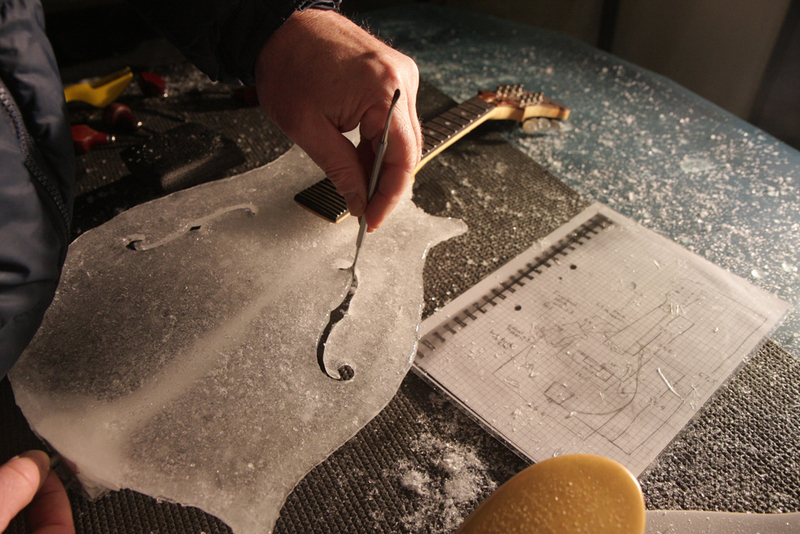 What tips do you have for avoiding injury as a musician? To find out more about the Two Moors Festival and this year’s event, taking place in October, visit our website today. 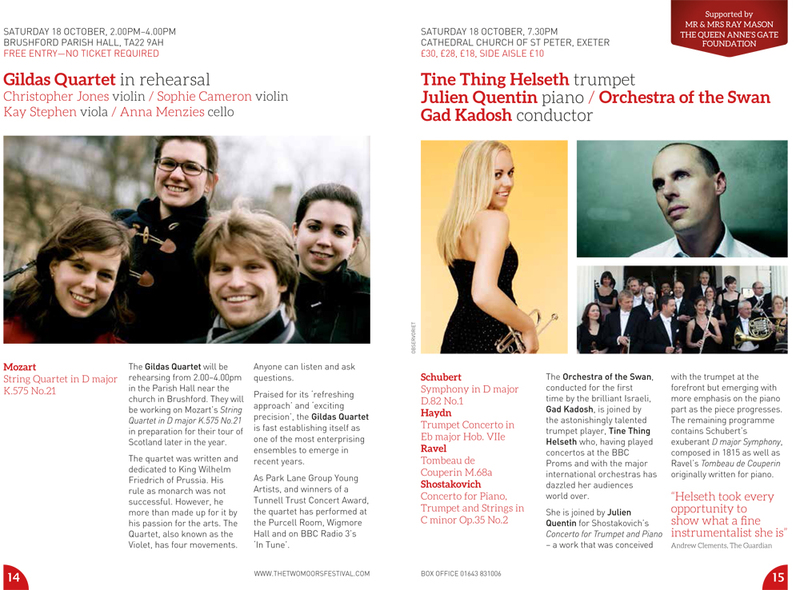 The Two Moors Festival’s main two-week event is drawing ever closer (taking place between October 15th and 25th) and no doubt the many classical musicians due to perform are already practising their pieces and getting as ready as they can. No matter how long you have been performing, an attack of the nerves can strike at any time and you never know quite how it will affect you. We once heard of a singer who really suffered from nerves and had to keep a bucket at the side of the platform because she knew she would throw up at some point before she went on stage. However, you’ll be pleased to hear that there are ways you can deal with stage fright – and they don’t all involve buckets. The first thing you need to remember is that you’re definitely not alone and countless musicians around the world suffer in much the same way you do (and if you don’t believe us, read this eye-opening article in the Daily Telegraph). It really does help to know that you’re not alone – and that no one is perfect! It also helps to be as prepared as possible and to make sure you’re as well rehearsed as you can be, so practice, practice, practice before the day of your performance. If you do feel the nerves approaching, do your best not to fight them. You need to acknowledge that they’re there and accept them – the more you fight against them, the worse they become. And of course, there’s the time-honoured tradition of having a quick tipple before heading out onto the stage. Just don’t overdo it, or you might find you are unable to play for quite a different reason! How do you fight the nerves? Let us know in the comments below. To find out more about the Two Moors Festival and to order a brochure for this year’s event, visit our website today. 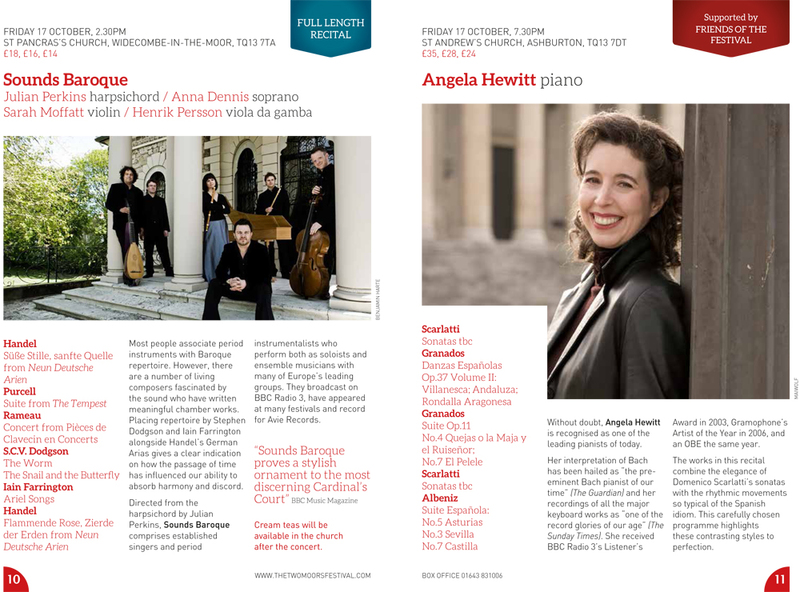 The Two Moors Festival brochure reveal! The moment you’ve all been waiting for is here – our brochures for this year’s Two Moors Festival (two weeks of glorious classical music in October) have finally landed back here at festival HQ! Take a look and let us know what you think. And if you’d like one delivered to your door, give us a call on (01643) 831 370 to request one. 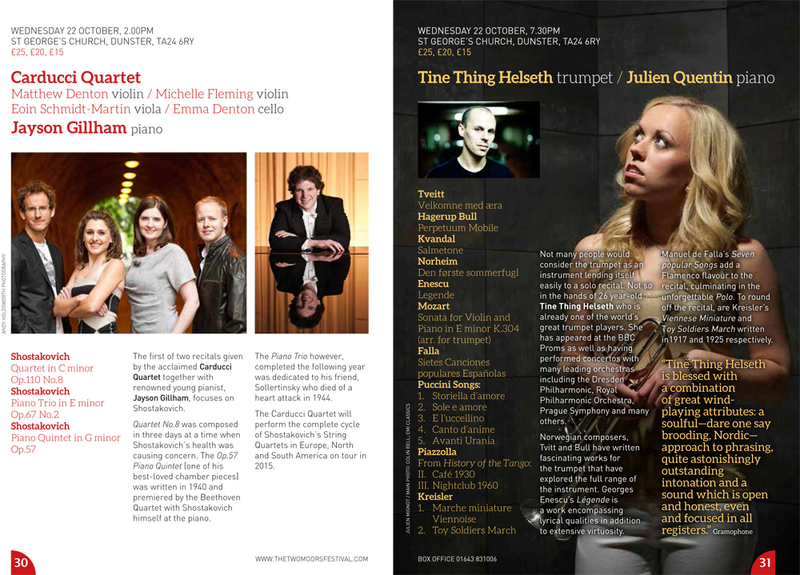 Here are a few sample pages of the brochure, showcasing some of the seriously impressive classical music talent we’ve got converging on churches across Dartmoor and Exmoor this year. 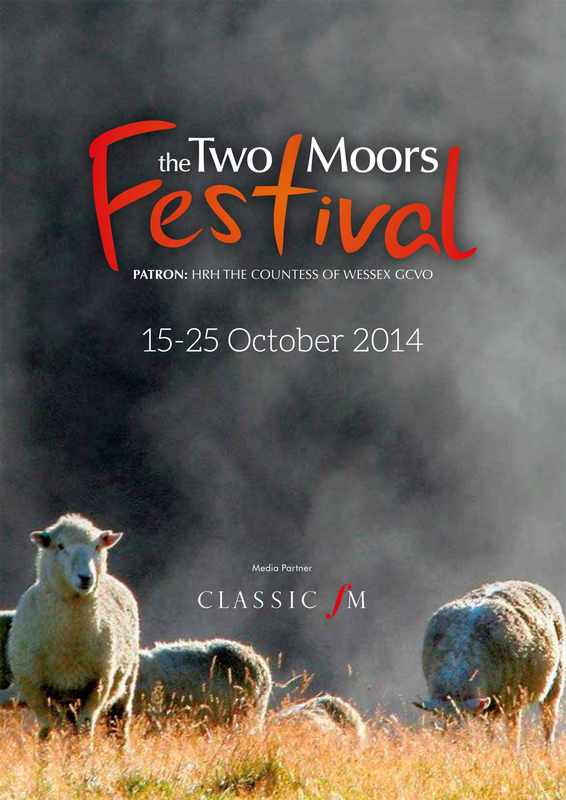 To find out more about the Two Moors Festival and to request a brochure, visit our website today. Each week, Two Moors Festival artistic director Penny Adie will be here on the blog, letting you all know just what’s been going on down at Festival HQ in Devon. I write this on Bank Holiday Monday two days after the Festival’s Final Round of Young Musicians Platform 2014 auditions. We selected the required four winners who this year did themselves proud. Their talent combined with natural musicianship and a fearless attitude to standing on the concert platform put them in a league of their own. There are exciting times ahead for these youngsters. The mention of fright relating to performance on stage has prompted thoughts on this incredibly important part of being a professional musician – or actor for that matter. It’s absolutely vital to be comfortable and confident while standing in front of an audience. Yes, it can be terrifying and is sometimes easier if you can hide behind the glare of spotlights. The true performer, on the other hand, is someone who enjoys the combination of excitement, tension and above all, is able to communicate his/her art to an audience. The performance of a concerto is going to affect listeners in many different ways: provoke tears, laughter, anger, evoke memories, experience feelings of sadness and excitement, become critical, compare one interpretation with another, judge the acoustics of the surroundings and so on. The list is endless. The crucial thing is for the performance to have had some kind of impact on those who heard it. This brings me to something else… It can be a lonely life playing a concerto. The adrenalin level is sky high while on the platform and the one thing an artist craves afterwards is a drink! He has finished his job, the conductor hasn’t. If there are no supporters present (and away from a big city, this is often the case), with whom, or where, do you have your drink? On the train? On the motorway – no! You arrive home shattered at 1am and after a mug of coffee roll into bed as the school run beckons a few hours later! If you want to find out more about the Two Moors Festival, head to our website! 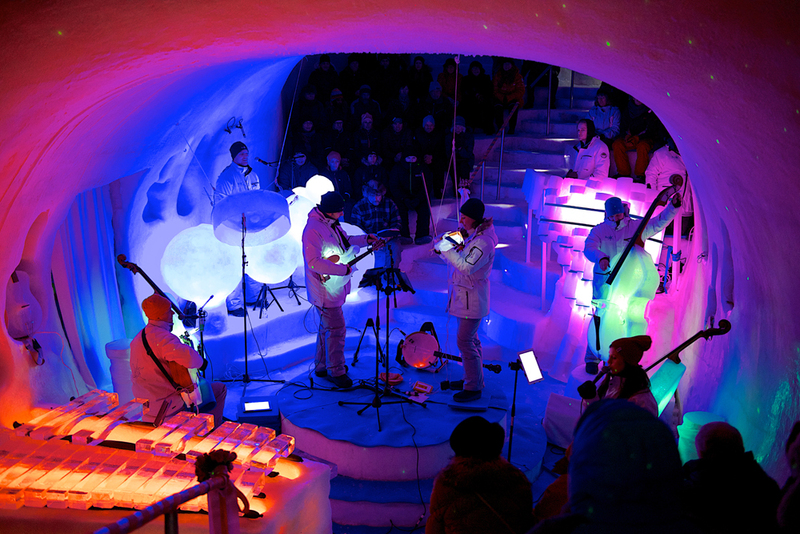 There are many reasons to visit Sweden – the skiing, the northern lights and husky rides across beautiful countryside to name just three – but now there’s one more to add to the list: The Ice Orchestra. 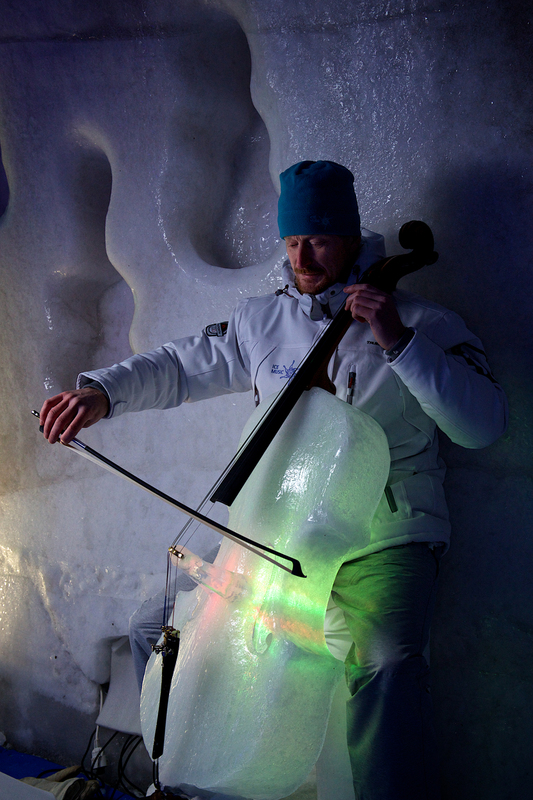 We think this would make the perfect outing for a holiday in Sweden but if you’d like to go in 2014 you need to book tickets quickly as the Ice Music concerts start in December and end in April. Audiences for orchestras in Britain have increased, a new report has found, rising by 16% since 2010 despite cuts to public funding, with over 4.5 million people seeing live orchestras play in the UK every year. Furthermore, over 660,000 children, young people and communities are reached annually in education and outreach programmes, the study by the Association of British Orchestras (ABO) revealed. 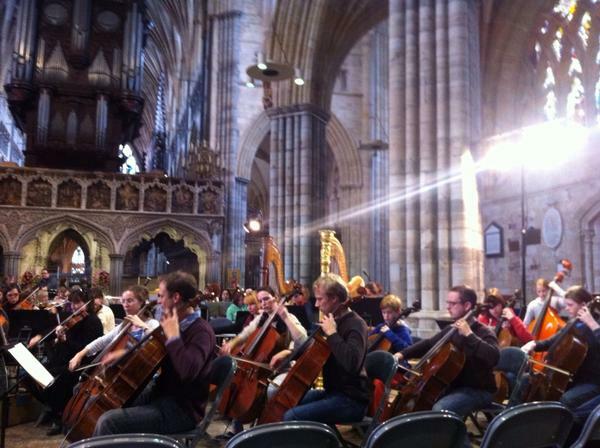 “Britain’s orchestras are doing better than expected in difficult circumstances. They are reaching a growing number of people in concerts and performances, and taking music to hundreds of thousands of children and others in the community,” chief executive of the Liverpool Philharmonic and chair of the ABO Michael Eakin said. It was also found that over 2,000 musicians have regular or full-time positions with orchestras in the UK, with British orchestras touring to 35 countries outside the country last year.